This is a sister site to hollowsun.com and is dedicated to the UK Novachord restoration project and the world's first Novachord sample library. Here you will find details of the restoration and the sampling project for this amazing tube synthesiser from 1939. Hollow Sun is renowned for its award winning sample libraries of vintage synthesisers and keyboard curios but this has to be the ultimate - the world's first analogue synth featuring subtractive synthesis with a totally programmable control panel allowing the use to create their own sounds. You might be forgiven for thinking this refers to some old Moog modular from the late 60s, maybe the custom Moog Wendy Carlos used on her 'Switched On Bach' albums or maybe the MiniMoog from 1971 but in fact, it refers to the Hammond Novachord from 1939 - yes ... 1939 - pre-dating Moog's designs by some 25 or 30 years. Not just that, it was polyphonic ... totally polyphonic, unlike Moog's monophonic offerings 30 years later! And not just that but the Novachord pre-dates the electric guitar and Les Paul's innovative work in that area and his pioneering work with multi-track recording and the incredible recordings he made with his wife by a decade or so. But Laurens Hammond designed, produced and was selling a 72-note polyphonic analogue synth many, many years/decades earlier than any of these! The technology employed was simply staggering and way ahead of its time. 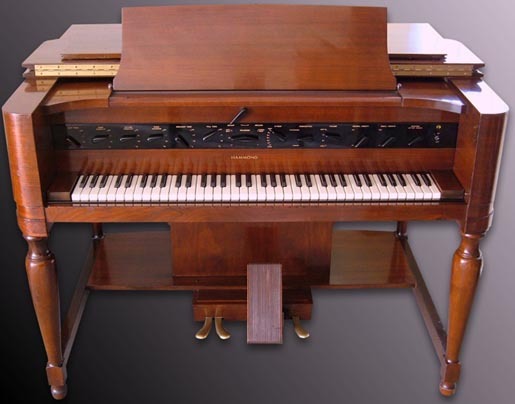 It had over 160 valves/tubes, over 1,000 capacitors, miles of hand soldered wiring in hand sewn wiring looms and featured mechanical innovations way ahead of its time that was presented in a gorgeous, hand crafted cherrywood cabinet weighing in at 1/4 ton - a piece of furniture of exceptional beauty. Little is known of this amazing instrument. Hardly surprising - only 1,000 or so were made between 1939 and 1942 until WWII and a shortage of electronic components halted production. Forever. When hostilities ceased, production of the Novachord wasn't revived. Sadly. Despite Hammond's best efforts to sell the the thing before the war, it wasn't a huge success. Because of the no-compromise and cutting edge (for the day) technology, it was very expensive, costing three times as much as a typical house at the time (around £500,000 - £750,000 today!! ), it wasn't exactly portable and, when all is said and done, was SO ahead of its time, it wasn't understood and people didn't quite know what to make of it. Even if you have never heard of the Novachord before, if you've watched some old sci-fi or horror movies from the 40s and 50s and TV series of the early 60s, you have most certainly heard the Novachard because it became a firm favourite with film composers of the time who exploited its unique sound making cababilities to create creepy, scary and uniquely atmospheric soundtracks which can be heard in many classic sci-fi films and TV series. Hollow Sun, in conjunction with Dan Wilson of Hideaway Studios near Bath, England, presents the world's first sample library of this unique and innovative instrument. This site is dedicated to that restoration and sampling project. It has been an incredible and fascinating journey from restoring this amazingly innovative instrument so ahead of its time and then meticulously sampling it and it's kind of bizarre that only now, we can begin to appreciate and creatively exploit the amazing sounds this fabulous instrument of a bygone era and a very different age can create.